Children enjoying an event at The Stages Festival, an outreach program of New Jersey Theatre Alliance. Marshall Jones III, Producing Artistic Director at Crossroads Theatre Company, accepting the Award of Excellence at Curtain Call 2014. Stage Combat Workshop at The Stages Festival. NJSCA's Don Ehman leads a discussion at the 6th Annual CAN Awards: a celebatory event for organizations that help make the arts accessible to people with disabilities. Sign interpreters at a sign-interpretation workshop sponsored by New Jersey Theatre Alliance. New Jersey Theatre Alliance offers public programs designed to make theatre more accessible and to enhance the theatre experience. We also offer a wide range of resources, services, and programs for member theatres and artists to help them achieve professional excellence and patronage. The Stages Festival is an annual, month-long festival of theatre which attracts an average of 10,000 children and adults each year. We offer over 100 performances and workshops free or at a steep discount in all or most of the 21 counties of New Jersey. 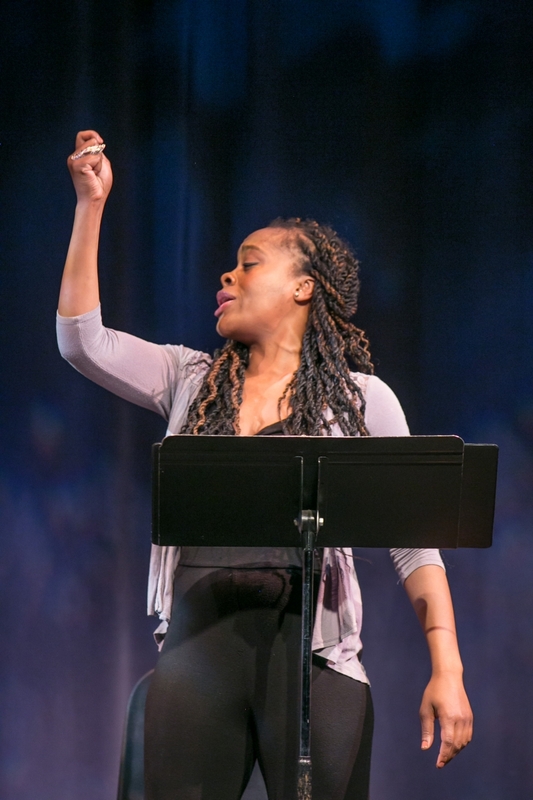 Programming includes touring productions by our member theatres, a stage combat workshop, a playwriting residency, a conversation series with artists, cabaret performances in senior centers, bi-lingual performances, and much, much more. The Stages Festival celebrated 20 years in March, 2017. I wanted to give a big thanks to all the folks involved in making The Stages Festival possible. It is such an excellent program for families in the community. As a former researcher on children’s outcomes I am aware that cultural events (such as plays) are associated with higher academic achievement in children. Providing multiple opportunities for all children to enjoy professional theatre is an amazing feat. Thank you. All I can say is WOW! The production this evening was wonderful. I heard rave reviews from parents as they left the room and I was so impressed myself. The cast was enthusiastic and top-notch. The set was adorable. Thank-you (and all the sponsors) for giving us the opportunity to provide professional theater for our community. I hope we will be able to have another show in the future. NJArtsTix, New Jersey Theatre Alliance's online discount ticketing program, offers the public discounted tickets to performances up to one week before showtime. Discounts from 25% and up on select performances at a variety of our member theatres and other participating venues help increase access to affordable theatre. To date, NJArtsTix.org has returned more than $1,000,000 to member theatres, and has helped them discover, build, and retain new audiences. Stay apprised of special events, current productions, and special ticket offers by signing up for our email blasts. Our Cultural Access Network Project (CAN), co-sponsored by the New Jersey State Council on the Arts/Department of State, instructs the cultural community how to serve and market to seniors and patrons with disabilities. Our Google Virtual Tour initiative helps patrons feel confident about attending performances by enabling them to see all public spaces and accessibility features online prior to their visit. To access a virtual tour of one of our member theatres, visit Google Maps and enter the name of the theatre in the search field. The Alliance lends listening enhancement equipment to theatres, provides training opportunities for audio describers and theatrical interpreters, provides sensitivity training sessions for theatre staff, and produces promotional materials that highlight accessibility performances and features of member theatres. We also assist member theatres with ADA compliance assessment and planning and offer mini-grants to theatres that need help making their facilities accessible. New Jersey Theatre Alliance’s annual Curtain Call celebration brings together New Jersey’s professional theatre community, business and government leaders, and theatre fans and supporters for an evening of food, fun, and evtertainment. At Curtain Call, the Alliance recognizes select theatres and supporters who have, through their excellence and generosity, made a lasting impact in the state and on the field. The Alliance staff and other experts in the field provide consulting services, workshops, conferences, and roundtable discussions on a wide range of topics such as fundraising, board development, marketing, educational programming, and strategic planning. New Jersey Theatre Alliance is actively engaged in advocating on behalf of our member theatres and the cultural community. We work to ensure that our government representatives provide support that reflects their understanding of the profound impact New Jersey's arts have on the quality of life and the economy of the state. The Alliance works collaboratively with ArtPride NJ, the state's arts-advocacy organization, as well other organizations, to ensure that the arts remain a funding priority on the local, state, and national level. Our Annual Combined Auditions, which allow theatres to audition about 250 actors in one place over the course of two days. Three commissions, three exciting new playwrights, three thought-provoking plays, three professional theatres, three productions, three public forums. This is the recipe for NJStageX: an exciting new program that unites the entire theatre community of New Jersey with the general public to nurture new works, bring playwrights into schools, and grow new audiences by focusing on local issues that touch their lives. Here's how it works: NJStageX.